A complete grain ration to be fed to growing and actives horses. INGREDIENTS: Grain Products. Processed Grain ByProducts, Forage Products. Plant Protein Products. Cane Molasses, Calcium Carbonate, Salt, Vitamin E Supplement, Monosodium Phosphate, Sodium Bentonite, Calcium Propionate, Choline Chloride, Copper Sulfate, Zinc Oxide, Active Dned Yeast. Manganous Oxide, Niacin Supplement, Ferrous Sulfate, Vitamin D3 Supplement, Mineral Oil, d-Biotin, Sodium Selenite, Vitamin A Acetate in Gelatin, Menadione Dimethylpyrimidinol Bisulfite, Vitamin B12 Supplement, Riboflavin Supplement, d-Calcium Pantothenate, Thiamine Mononitrate, Ethvlenediamine Dihydriodide, L-Lvsine, Natural and Artificial Flavors, Folic Acid, DL-Methionme, Pyridoxine Hydrochloride, Cobalt Carbonate. 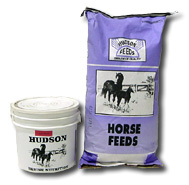 Feeding Directions: Hudson’s Sweet Pellets are designed to be fed to as the complete grain ration for horses. Generally, feed .5 to 1 pound per 100 pounds of body weight. The specific amount will depend on the age, condition, and activity of the horse. An acclimation period of two to four days for horses not accustomed to eating complete pellets is not uncommon. A gradual change from sweet feed to pellets over those few days is generally recommended and problem free. Hudson Sweet Pellets are to be fed with a good quality roughage or pasture. Salt, mineral and fresh, clean water on a free choice basis are also highly recommended.